The Nigerian Well known and trustworthy road transport company celebrate their 25th Birthday and delivering the beat of services to Nigeria and some other African countries. 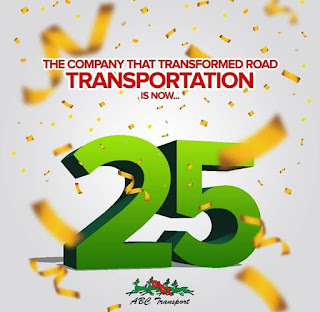 ABC Transportation happened to be the leading transport company in Nigeria and affordable to their customers nationwide When it comes to road travel needs. Long live ABC Transportation, Long life Nigeria from all of us at Firstone Nigeria.